Shedd and Kris Waskosky have served in Ecuador since 1987 as Bible translators among the Salasaca Quichua people of the Andean highlands. March 24, was a day filled with excitement in Salasaca, Ecuador. It was the culmination of over 30 years of translation work for Our Saviour’s (OSLC) missionaries, Kris and Shedd Waskosky. On this day the New Testament, in Salasacan Quichua, was dedicated! 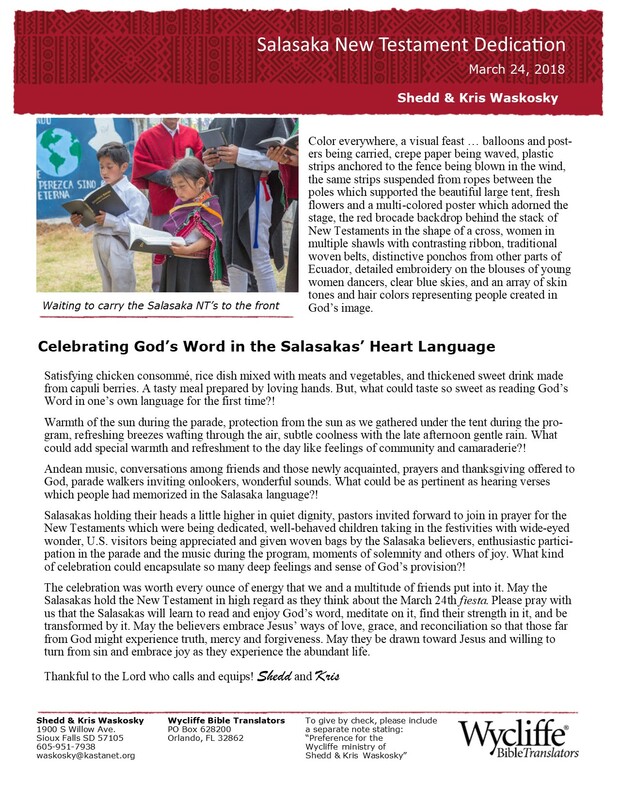 May God open the hearts of the Salasacans as they read His word in their own language. Representing OSLC was Priscilla Anderson and Kay Anderson. Kay was the first OSLC disciple to visit and assist in their work. Click for pictures of the event. Click for dedication letter. Check out the Salasaca Quichua website at www.diosmundaYachana.org.